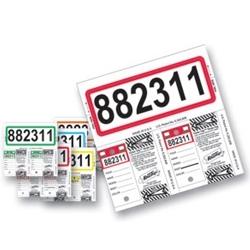 Exciting patented product combines consecutive numbering with the durability of genuine Versa-Tags! Each Consecu-Tag® makes a clear plastic-backed window stock sticker AND two self-protecting key tags. Key Tags fold to 1-1/4" x 3", Stock Sticker 3" x 6"